Instead of making the classic gingerbread man for Christmas, we are making Lemon Butter Cookies. These cookies are in the shape of a gingerbread man. In large bowl, beat butter and sugar until fluffy. Beat in eggs, milk and lemon juice. Combine flour, baking powder, salt and baking soda; gradually add to creamed mixture and mix well. Cover and chill for 30 min to 2 hours. Preheat oven to 200°C. Line baking trays with baking paper. Roll out dough on a lightly floured surface to 4-5mm thick. 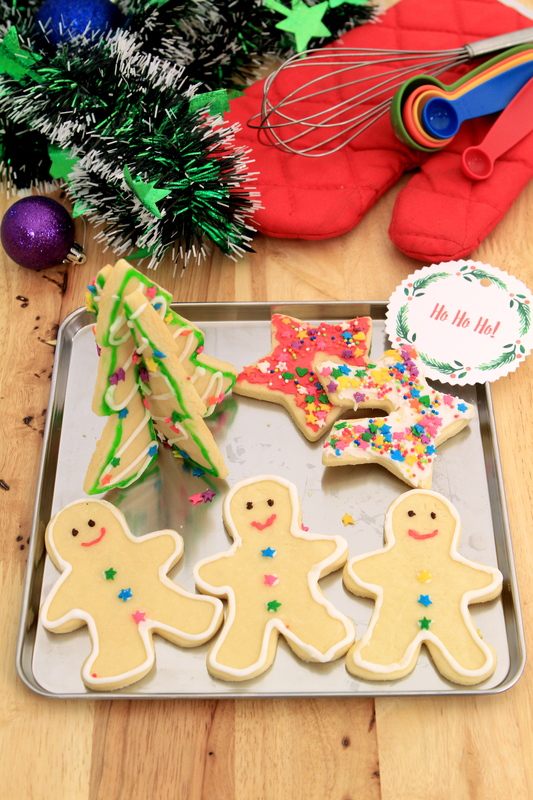 Using 8cm Christmas cookies cutter of your choice, cut shapes from dough and place on trays. Re-roll dough scraps once and cut more shapes. Bake for 8-10 minutes or until the edges turn light golden. Remove to wire racks to cool. Mix icing sugar and lemon juice in a bowl. Divide prepared icing into small plastic bags. Add food coloring in separate plastic bags. Cut a small hole in a corner of each bag. Pipe icing over the cookies to decorate. Leave to set for 1 hour.